Ok. This isn’t really a cake. But is is low fat. And it is vegan. And it does contain strawberries. Lots of strawberries. Yum! Prep strawberries by washing and stemming all of them. 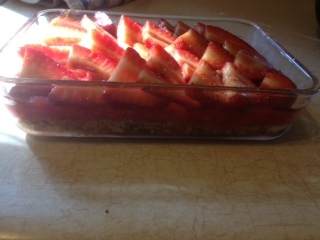 Slice about half of the strawberries into thin slices and place them in a bowl. 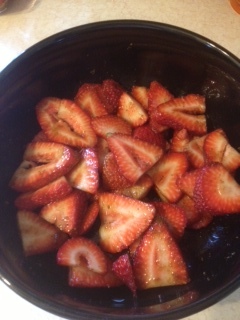 Top the sliced berries with coconut sugar (or other sweetener), if using. Set aside and allow to macerate for at least 30 minutes. 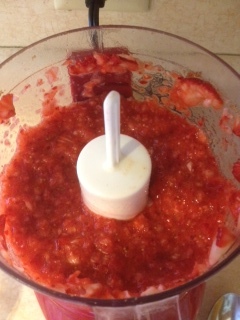 Place the remaining berries in a food processor and pulse until berries become a chunky paste. 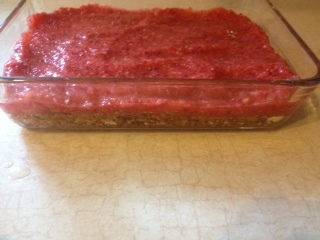 Place processed berries on top of date/fig mix in pan. 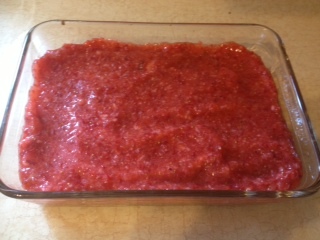 Refrigerate while remaining berries are macerating – about 30 minutes. 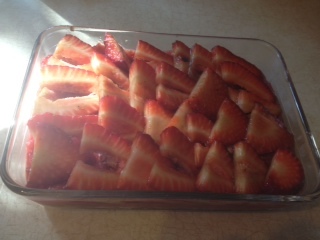 Remove from refrigerator and top with sliced berries. 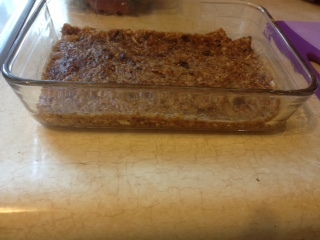 Return to refrigerator overnight for a more ‘cake’ like texture. This dessert is surprisingly cake like after it sits overnight in the fridge. If you want to cut and serve as a cake, consider doubling the amount of dates/figs. 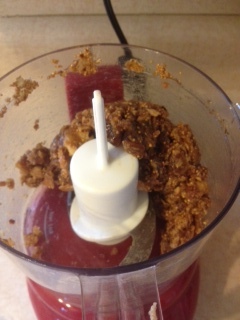 If adding fat is an option, process some shredded coconut or almonds/almond meal with the dates/figs. This will also make the base layer more cake like, and it will allow for cutting and removal of cake pieces from the pan. For a more gel-like middle layer, add chia seeds to the processed berries. My strawberries were very sour. (Strawberry season hasn’t hit my part of the country yet.) If yours are too, you may want to add sweetener to the processed berries as well. Remember, however, the sugar from the macerated berries on top will soak through to the processed layer as the cake sits. For a sugar free cake, use a non-nutritive sweetener like stevia to macerate the berries. I love this recipe because it’s 80-10-10 friendly, and it fit nicely into my month of raw challenge. If you’re interested in incorporating more raw foods into your diet, join us for the Raw Fusion Challenge on Facebook. Everyone is welcome, regardless of your dietary choices, but the focus of the group is high-raw vegan. Don’t miss out on the after-the-blog fun; follow Veggie V on Facebook, Twitter, and Pinterest! Sharing the raw-vegan love…Slightly Indulgent Tuesdays, Allergy Free Wednesdays, Raw Food Thursdays, Healthy Vegan Fridays, Wellness Weekends. Thanks for sharing this at RFT! 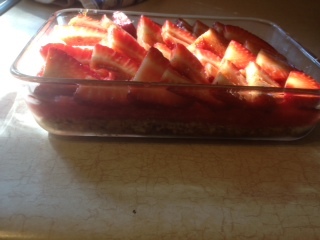 I have a quart of strawberries in the fridge just waiting for a recipe like this! Pinning this to the RFT board!